Legendary Japanese animator Hayao Miyazaki has been making a series of rare public appearances in support of the American release of his Ponyo later this summer and our very great thanks go out to Doug Jones who has hit a number of Miyazaki's appearances on our behalf. What follows is not a transcript of any one of those events but rather elements from each combined and organized by theme for a fascinating look at the man and his work. Check it below the break! In anticipation of the upcoming release of Ponyo, Hayao Miyazaki agreed to make a rare visit to America. As if making up for all the times he didn’t come to the States, such as when he skipped the Academy Awards the year Spirited Away won Best Animated Feature, Miyazaki managed to do a lot during his time here. His first stop was the San Diego Comic-Con, where he received a standing ovation from Hall H’s 6500-strong audience. Next, it was up to the Bay Area, where he accepted an award from the Center for Japanese Studies at University of California: Berkeley. Then, he traveled to Los Angeles, where he hosted a screening of Ponyo at the Academy of Motion Picture Arts and Sciences and endured a day of press conferences. Throughout it all, John Lasseter was at his side. In fact, without Lasseter, Miyazaki’s visit would not have happened. “I’m sorry, but I don’t really like these sorts of events,” Miyazaki told a small room full of journalists in Los Angeles. Nevertheless, he was mostly gracious, answering questions and accepting accolades wherever he went. I was lucky enough to be present for two of his stateside appearances—Comic-Con and the Los Angeles press conference—and here’s some of what he, and John Lasseter, had to say. John Lasseter: Can you talk a little bit about how you develop your stories? Lasseter: When I visit him, I’m always amazed. We work so hard at Pixar. We have a storyboard team, and we work very close to work and rework and rework our sequences. I go over to sit and watch him, and he sits down at his desk and starts. He just does everything himself, and his boards are so beautiful. They become the layout for his films, and it just comes out of his head. That’s not really a question, I guess. I’m gushing because I’m sitting next to Hayao Miyazaki. Miyazaki: I know John Lasseter knows as well, but it’s really hard to explain what becomes the motivation or the instigation to do a film. I feel that I was searching in my subconscious with a fishing net, and I happened to catch a goldfish in my net, and that was the inspiration for starting this movie. Question: One of the stories that inspired Ponyo was the same story that inspired The Little Mermaid. What do you feel are the differences between your interpretation and the other animated Little Mermaid? Miyazaki: I wanted to make it a simple story and to show simplicity through the colors. Also, since the main character is red, a goldfish, I didn’t want her colors to overwhelm the other colors, so the other colors had to be bright as well. Lasseter: The music in your films is amazing work by Joe Hisaishi. How early do you bring him in on the process? Question: What did you want to be careful of in adapting the film for English language? What changes needed to be made, so you can get the same effects in the English translation? Miyazaki: I entrusted the English version to my trusted friends, so I didn’t worry about it. I just stayed in Japan and didn’t worry about it. Lasseter: One of the biggest challenges in taking and creating the English-language versions of Miyazaki-san’s films… This is the third, no, the fourth one I’ve really worked on: Spirited Away, Howl’s Moving Castle, Tales from Earthsea and now Ponyo. I don’t ever want the English version to change anything in Miyazaki-san’s story. The goal is to make the film for American audiences and just for the language to be very natural. You don’t think of this as being a dubbed Japanese film. That’s not what we want. We want everyone to just get swept away with the story. However, there are sometimes things that Japanese audiences will understand visually that American audiences won’t. In those cases, what I always strive to do is to make sure the American audiences will be at the exact same level of understanding at that one time in the movie as a Japanese audience would be. An obvious example of that is back on Spirited Away, when the main character is walking and when she’s exploring the village, she looks at this building. All Japanese members of the audience would look at it and know right away it’s a bathhouse, but no one in this country would know that’s a bathhouse. So you just add a little line of “Oh, it’s a bathhouse.” It’s little tricks like that. That’s not changing anything. It’s just keeping them understanding. One of the things to understand is in Japan, especially with Hayao Miyazaki, he always records the original dialogue after he’s finished the animation, which is different from what we do in this country. We always record the dialogue before we do the animation. So the lip-sync is somewhat on the rough side anyway. It helps us fit the words in there. But we try very hard working with the actors to get the lines of dialogue to fit with the right mouth movement, because you don’t want to have someone sit there talking and nothing’s coming out or saying a whole bunch of words, but there’s no mouth movement. You want to try and fit it in there. The goal is the lights dim, the audience in America is taken away, is swept away by this beautiful story and visuals and the characterizations. So we work really hard to make it seem as natural as possible. Question: You mentioned Tales from Earthsea. Miyazaki-san, since your son directed that film, and it occurred before Ponyo, what has he been doing since in carrying on the family tradition? And Mr. Lasseter, I didn’t realize you had already prepared a version of that. I thought there was a rights issue with the Ursula Le Guin estate. What is the status of that? Lasseter: We’re just kinda wading through that, and there’s a time limit. It will be released at some point. Question: But the version is ready to go? 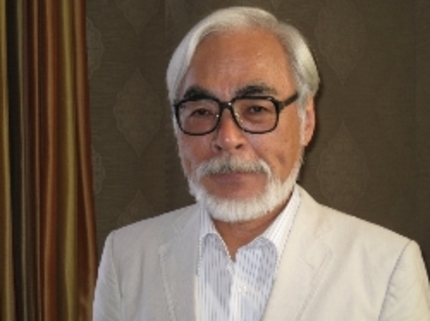 Miyazaki: My son is now in childrearing. Lasseter: Which is very important to Miyazaki-san. Miyazaki: That’s a very important process. Question: Is there anything more to be said about your son’s interest in animation? Question: After using computer technology on a couple of films, Ponyo marks your return to completely hand-drawn animation. Was there something specific to Ponyo that inspired that? Would you have done that with whatever your next film would have been? Miyazaki: Actually, Studio Ghibli had dissolved the computer graphics section before we started production on Ponyo, so we had decided at that point to stick with hand-drawn animation. Just as John Lasseter and I are different, I think I can leave the computer animation to him. Question: Would you like to make a 3D movie? Would you ever permit one of your movies to be converted into 3D? The first thing I saw of Hayao Miyazaki was the first film he directed, Lupin III: The Castle of Cagliostro. I was so taken by the humor and the heart of the film. And also the way he staged action, and it was a hand-drawn animated film. I was so interested in that, because there was a car chase towards the beginning of the film that, to me, is still one of the best car chases on film. It’s so sophisticated and simple how he created depth, tremendous depth, using hand-drawn animation. He would have foreground… like parts of the foreground were hand animation to give a sense of moving them around. It was a mountain road, and he animated the road, and then the mid- and background levels were split up into many levels, and he would slide them sideways. It gave this tremendous depth, three-dimensional depth. I was amazed at how simple the solution was he did. I was so excited about it. Miyazaki: Watching John Lasseter’s films, I think I can understand better than anyone what he’s doing is going straight ahead with his vision and working really hard to get that vision into film form. I feel my understanding this is my friendship toward him. Lasseter: That’s sweet. I would say the thing that has inspired us at Pixar, probably more than anything else… The best way to describe it is Miyazaki-san celebrates the quiet moments in movies, which is very opposite of Hollywood tendencies, you know, of loud and faster, more and more and more, quicker cutting. If you watch his films, there’s a few places where—and they’re really beautifully strategic about where the action and everything is—there are these beautiful quiet moments. What he does is it actually sets up sequences that come right before or right after because of the contrast. I think if you watch Up, Pete Doctor and myself were so inspired by this that there are some beautiful moments in Up that are really, very Miyazaki-like in the quietness of it. Cross-published on GhibliWorld.com with additional imagery. I saw him at Comic-con. It was my main reason in going. He was so gracious. But, I could tell he was overwhelmed by the whole experience. I cannot wait for Ponyo.